With StoAmigo TackApp, you can turn any folder on your Mac into a cloud folder and make it accessible from anywhere in the world. You will be able to find any contents you store in that folder on any computer, using a web browser. What's more, the necessary preparations can be made in a matter of seconds, without any kind of difficulties. Like other cloud-based applications, StoAmigo TackApp works only if you log into an online account, which can be created quickly on the StoAmigo website. When launched, the application will prompt you to log into your account. Once you are logged in, selecting a folder on the application's compact user interface is all you need to do. The selected folder will be shared automatically through the StoAmigo service, on your personal account. Once it is shared, you can log into your online account on any web browser, on any computer, to find your shared data on a web interface. It is possible to upload files directly through the online interface and you can also store them in custom folders, besides the one from your computer. 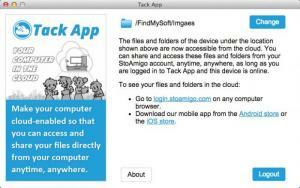 The best part is that StoAmigo TackApp can be installed on both Mac OS X and Windows and it is also available for iOS and Android mobile devices. Furthermore, you can install the application on multiple computers and link it to the same account. As a result, you will be able to exchange files between your computers faster and easier. When it comes to storing files safely and transferring them between computers, StoAmigo TackApp will make these operations straightforward and easy. You can store files in the cloud and transfer them between different machines. Selecting a folder is all you need to do. The application is cross platform and it can be installed on multiple computers, using the same account. You can't share more than one file on the same computer. You can download StoAmigo TackApp free here.